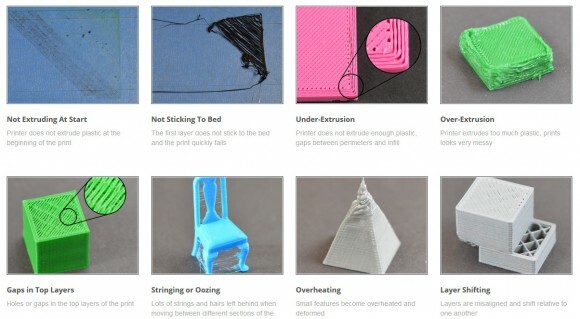 The developers of the one of the most advanced if not the most advanced slicer for 3D printers – Simplify3D, have published a very useful resource for anyone having various issues with their 3D prints. The print quality troubleshooting guide is a great place to start if you are trying to improve the quality of your 3D printed parts by first identifying what possible issues you might be experiencing and then learning how to get rid of them. The guide offers a big list of the most common 3D printing issues along with the software settings that you can use to solve them and the best is that there are real world photos of the issues in action to make identifying them even easier. Pretty much anyone that has used a 3D printer has experienced some of these issues and had to deal with them and had to try to resolve them. We have published some tips for some of the issues we’ve encountered while 3D printing ourselves, but the Simplify 3D guide is a more extensive one and some of the tips you get can also help you with using better the Simplify3D software. Other tips for resolving issues can be fixed regardless of the software you use, but having a slicer that allows you more control over the printing process like Simplify3D can be quite helpful at times. The guide can even help you find out that you might be having a problem that needs attention and you were thinking that this was the normal behavior of your device, this is especially true for novice users that do not have a lot of experience with 3D printers.